It is said that Sotha Sil's Fabrication Chambers can analyze anything in the Mundus, organic or inorganic, and reproduce it in clockwork form. Tel Fyr, the entrance to the trial. The Halls of Fabrication are a part of Sotha Sil's Clockwork City. It is an enormous processing facility where Sotha Sil collected and broke down Dwemer machinery to repurpose their brass into his own machines. 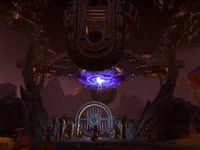 At some point in the past, Sotha Sil ordered the facility to cease production on the machines inspired by the dwarves, and left behind its central intelligence the Assembly General to continue alone. 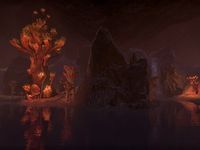 A portal to the facility opened in Nirn within Abanabi Cave, spewing out Fabricants which decimated the local wildlife, and threated Divayth Fyr's expansion of Tel Fyr. Halls of Fabrication Objective: Join Divayth Fyr's expedition into the Halls of Fabrication. Forging the Future: Stem the tide of fabricants before they overwhelm Tel Fyr. To Tel Fyr: Investigate a rift at a mage's tower. The following lorebooks can be found inside the trial: Cogitation Log 1322331455212478, Divayth Fyr's Notes, Tel Fyr, and Telvanni Journal. 5 items: When you use an Ultimate ability, you and the closest 2 allies within 28 meters of you gain Major Aegis for 10 seconds, reducing your damage taken from Dungeon, Trial, and Arena Monsters by 15%. 5 items: When you use an Ultimate ability, you and the closest 2 allies within 28 meters of you gain Major Slayer for 10 seconds, increasing your damage done to Dungeon, Trial, and Arena Monsters by 15%. This page was last modified on 18 February 2019, at 17:15.